I'm always searching for audio products that enjoy an outstanding quality/price ratio. Normally, speaker stands are expensive, so much that sometimes it is better to purchase small tower floorstanding speakers instead of a pair of bookshelf speakers + stands. Small towers have a larger internal volume, hence a deeper and more powerful bass range. Moreover, the combo “bookshelf speaker & stand” can be dangerous in a living room, if children or pets are around. On the other hand, small enclosures normally “disappear” better, in the sense that the soundstage they are able to create is wider and more realistic. The closer you get to the ideal point-source emission the better the image. Floorstanding loudspeakers are much more “visible” and hence it is easier to perceive the sound coming directly from the cabinets (and drivers) instead of from the space surrounding the speakers. For these reasons bookshelf speakers (or “freestanding” speakers, as they are sometimes called) are still preferred by many audiophiles. Still, the main dilemma is: isn't it a pure nonsense spending 500€ for the speakers and 300/400€ for a pair of good stands? In my opinion, it is a nonsense, indeed. Over the years, we have proposed some DIY recipes in order to cut down costs on speaker stands. For less than 100€ (or much less than that) one can build something reasonable, custom tailored to suit one's needs. 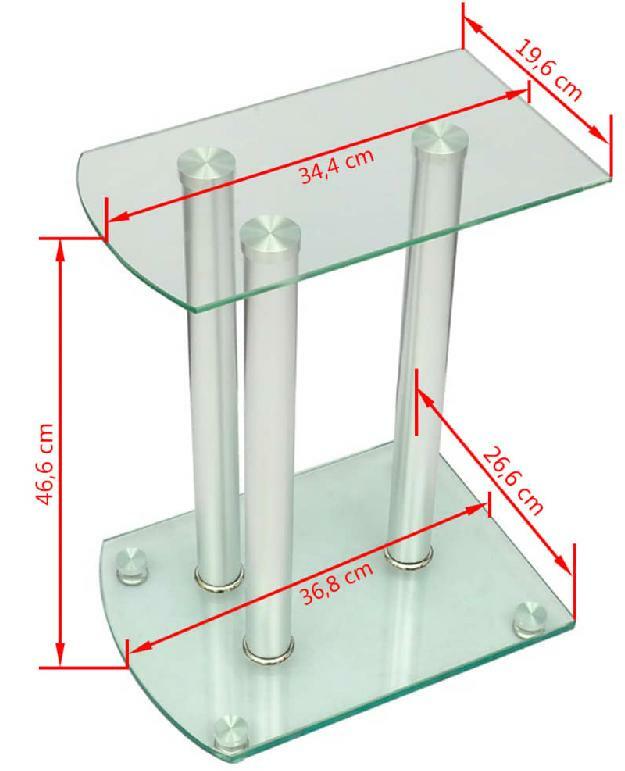 What if a commercial stand, made out of thick security glass plates and aluminium legs, was available for less than 50€? Enter the Vida XL speakers stands!!! These are 45€/pair speaker stands (shipping included) that can make DIY completely obsolete. The VidaXL is a three-columns glass and aluminium stand made out of thick security glass plates. The aluminium columns can be filled with sand, lead shots, any other damping stuff, or left empty, if desired. The stands are available in two different finishes: transparent glass and black glass. The two plates are connected via a three thick rods which are hidden inside the aluminium legs. Four hard rubber feet can be threaded to the bottom plate, making it adjustable in height for easier levelling. Of course, you can decide to use spikes or any other kind of coupling/decoupling feet. The stands arrive in a small parcel because you need to assemble them on your own, IKEA-style. All you have to do is unpack the parcel once it arrives and follow the easy step-by-step instructions. Read them carefully. There are idiot-proof images that should help. You'll be finished in less than 30 minutes (for a pair of stands). When in doubt, re-read the instructions. There's no need to overtighten the connecting rods to make the stand stiff and stable. Overtightening can be dangerous and lethal for the glass plates. The stands are available in two finishes but, unfortunately, in just one height: 46.6 cms, which is enough for most applications, though smaller bookshelf loudspeakers could benefit from 60/70 cm. Despite the extremely low price, these stands are nicely finished, especially the glass plates are extremely cool! The structure can hold speakers up to 45 kg (!!!) and the top plate is 34.4 x 19.6 cm, which means that you can accomodate even very large (and heavy!) bookshelf speakers. Each stand weighs 4.7 kgs, which can be “improved”, if necessary, with sand, lead shot or that ingenious Atacama Audio Atabites filler we reviewed some years ago. 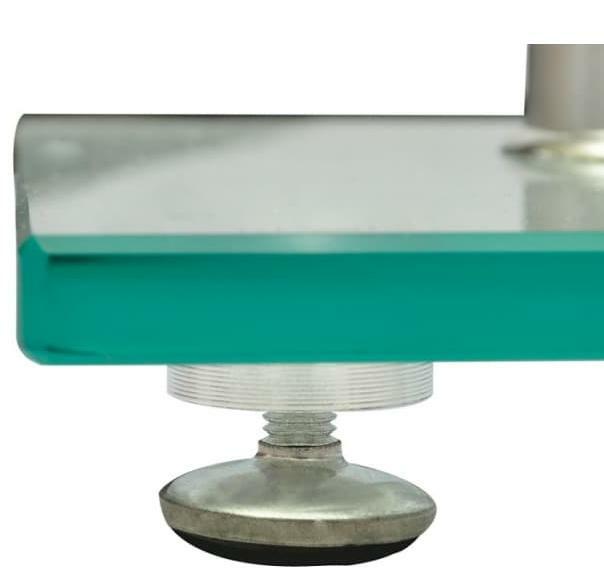 Normally, filling speaker stand columns with damping material improves the bass range, but many audiophiles seem to prefer light and stiff stands because they tend to resonate at higher frequencies. Generally, the heavier the structure, the lower its frequency of resonance. You can, of course, fill the columns partially, until you reach the desired result or the best compromise. Out of the box, these speakers stands get the job done, amazingly! They are reasonably stiff and do not resonate. They work very well even with large and heavy speakers. As you may know, weak speaker stands tend to flex under the weight of a large loudspeaker, not so these surprising VidaXL! With spikes they become even more rock solid. Their stiffness helps tightening the bass range and improving the focus of the 3D image. Moreover, since speakers don't oscillate even at high listening levels, the dynamic performance is as good as it can be. Moreover, and this is a big plus, they are extremely cool looking and can work equally well in different room decor, if you consider the two color options. As said above, do not overtighten the rods. As a rule of thumb, tighten them until the feel is firm and stiff. Follow the instructions carefully and remember that the steel nuts shouldn't be tightened against the glass plates directly, use the supplied washers! Feel free to experiment with different kind of feet/spikes. Considering how slippery the glass might be, I'd suggest placing four small blobs of Blu-tack or equivalent (UHU-Tack, Tack-It etc.) at each corner of the bottom of the loudspeaker. This trick improves safety (speakers can't fall from the stands) and minimizes vibrations as well. As far as I know VidaXL stuff is available almost worldwide, I've seen VidaXL websites anywhere in Europe (UK, France, Spain, Germany etc. ), in Australia, USA etc. Just search for “VidaXL” on Google to locate the website in your country. They sell directly and, in my experience, they deliver the stands in less than a week. When on their website, search for “speaker stands” or for the directory “audio accessories”. These stands are also available on Ebay. None! Seriously, at this price these stands can't be beaten, not even by our more inexpensive DIY designs! I'd love to convince VidaXL to design and sell these stands in different heights, it would be a worldwide success. What else can I add? These stands are nicely crafted, easy to assemble, cost almost nothing considering the finish and the materials and get their job done amazingly well. They can even be easily tweaked/improved, what else could an audiophile desire? An absolute, dare I say insane, bargain! Purchase them while supplies last. Recommended? No, a must-have.